Penasco Blanco sits on the western edge of Chaco Canyon, where Chaco Wash meets Escavada Wash and become the Chaco River. As such Penasco Blanco was one of the first Great Houses built in Chaco Canyon, and likely had a revered place in Chacoan mythology. Holding to its special status even to this day, Penasco Blanco remains one of the hardest-to-reach ruins that is open to the public in Chaco Canyon proper. The hike leaves from the parking area at the end of the Chaco Loop Road, where the Pueblo del Arroyo and Pueblo Alto trails also depart. Before beginning this hike, I highly recommend purchasing the Park's Backcountry Guide book, a cheap and informative booklet that describes in more detail some of the interesting historical and prehistorical facts and items of interest along the trails. For the first couple hundred yards or so, in fact, both Pueblo Alto and Penasco Blanco follow the same old service road towards Kin Kletso, the San Juan Phase house beneath the Crack that allows access up onto Chaco Mesa. While the Pueblo Alto trail heads upward, however, the Penasco Blanco trail simply follows the cliff face past the ruin along the service road towards the west. The road bends and dips going into Cly Canyon, then straightens back out as it passes another San Juan-style house, Casa Chiquita, or Little Tiny House. Bikes are allowed on the Penasco Blanco trail up to this point, and there is a bike rack available for parking in front of Casa Chiquita. From here the trail is foot-travel only. Past Casa Chiquita as well, the trail leaves the old service road that has served as the trail since the parking area, and instead follows a historic Navajo wagon road that led from Chaco all the way up to Hogback along the San Juan river between Shiprock and Farmington. Quite the trek! It is along this stretch, about half a mile past Casa Chiquita, where some of Chaco Canyon's best rock art becomes visible on the cliff to the north. A spur trail, the Petroglyph Trail (not to be confused with Chaco's Petroglyph Trail between Bonito and Chetro Ketl), goes along the base of the cliff with markers pointing out the most prominent or important panels. It is certainly worth taking the Petroglyph Spur either coming or going from Penasco Blanco. Alternately you can chose to only go as far as the end of the Petroglyph Spur, making the round trip only 4 miles. From the end of the Petroglyph Trail, the Penasco Blanco trail drops down into a wash, with a small cottonwood. This is the only shade on the entire hike until after it crosses Chaco Wash in another mile or so. During the summer especially it is a good idea to take a breather in the wash.
After the trail climbs out of the wash, it angles out across the flatlands away from the cliffs, which are also, at this point, growing lower. Although you are still hiking on the old Navajo wagon road for another 3/4 mile, it is often hard to make out, and eventually the hiking trail diverges from it. Penasco Blanco has been visible on the southern point through out most of the hike, but as the trail now approaches Chaco Wash, Penasco Blanco begins to disappear from view as you draw near the edge of West Mesa and the Chaco Wash which runs hard up against it. Take note: Do not attempt to cross Chaco Wash if it is flowing. The banks can be steep and slippery, and the current deceptively swift. Also, if you have purchased a trail guide at the Visitor's Center, note that there is no spur trail to the Supernova Pictograph. The trail has been rerouted so that the way to Penasco Blanco goes directly by the Supernova Pictograph. After crossing Chaco Wash, you finally enter the shade of the low cliffs of West Mesa. Just beyond the crossing, back on the level of the old canyon bottom out of the arroyo, the trail comes to one of the most remarkable examples of rock art in the southwest. In 1054 a lone star in the constellation Taurus blew itself apart in a horrendous explosion. This exploding star was able to be seen, as we know from Asian astronomers, during the day as bright as the full moon. What the Chacoans thought of this supernova, which created the Crab Nebula, and what they called it we can never know. What we can know, however, is that the brightest appearance of the Crab Nebula Supernova was just before sunset after its third day, not too far away from the setting crescent moon. Below the then-occupied Great House of Penasco Blanco some Anasazi artisan painted a crescent moon and a star-burst shape very close together, and then painted a handprint. Some Pueblo informants say that a painted hand designates the site as sacred. Does this pictograph actually represent the Crab Nebula Supernova? Maybe. It is certainly a reasonable explanation. From the supernova site, the trail continues for a little while along the foot of West Mesa. It drops in and out of a couple small drainages before climbing up onto the next bench. In the second drainage past the supernova site, look for a stone ramp at the base of a pourover, and some carved steps on the slickrock above the ramp. This is part of a Chacoan road that ran up from the valley floor, made an abrupt turn above the steps visible on the slickrock, and passed very close to Penasco Blanco before heading out towards Coyote Canyon to the southwest. Once you are on top of the bench, the trail heads back to the west, with Penasco Blanco once again visible, and much more immediately close. Try and keep an eye out for the drainage where the steps were - you can catch a faint glimpse of the road before it turns. The trail then follows directly on top of the road for a short while, making the road hard to see. The trail angles away from the road, though, as it approaches a side-canyon that the ancient road cuts straight across. The road becomes slightly more visible as you move away from it, though it is best seen in morning or evening light, and it certainly helps if you have seen other Chacoan roads from the ground, like at Pueblo Alto or the Bluff Great House. As you round the head of that last side canyon and recross that Chacoan road one last time, you find yourself finally at Penasco Blanco. To the west, on a clear day, stretches a vista that encompasses parts of Utah, Arizona, and New Mexico, from the immediate Chaco River to the distant Chuska and Abajo Mountains. Looking north Sleeping Ute Mountain, the San Juan Mountains, and occasionally Mesa Verde can be seen. 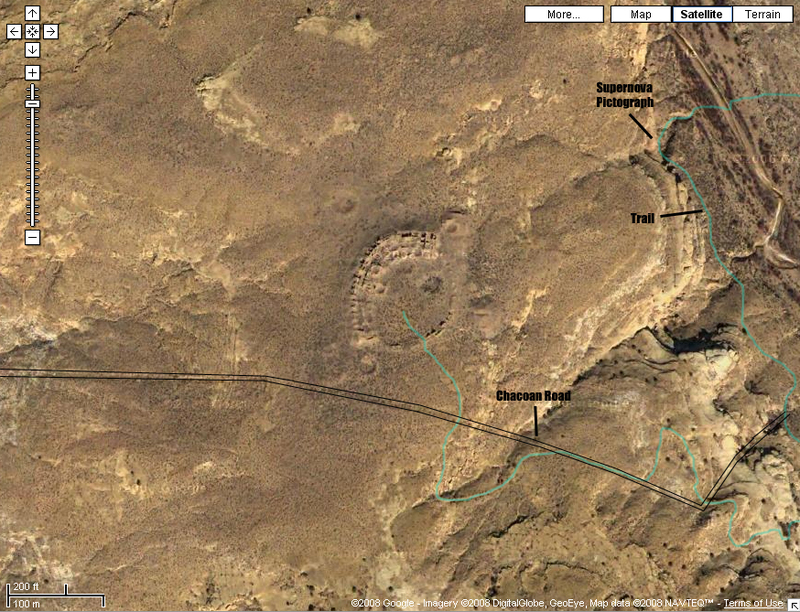 And to the east, most of Chaco Canyon is visible, with several of the most prominent Great Houses like Pueblo Bonito and Pueblo Alto easily discerned from Penasco Blanco's eastern wall. Take plenty of time to explore the ruin, staying on already established trails and out of the midden. The Great House was constructed over a long period of many centuries, starting around 850-900 AD and continuing up through about 1050 AD. The oval shape is unique among Chacoan Great Houses. Remember to leave all artifacts where you find them. After enjoying an afternoon reaching and exploring Penasco Blanco, return to the trailhead the way you came. Make sure to time your hike properly, as all trails, ruins, and the loop road close at sunset. From Grants, NM, drive north on NM Route 605 until reaching NM Route 509. Turn left onto NM Route 509. Follow Route 509 north until reaching Navajo Route 9. Turn left onto Navajo Route 9. Proceed on Route 9 until reaching NM Route 57. All of these turns are marked with signs for Chaco Culture National Historic Park. WARNING! NM Route 57 is a very poor road, with bad washboards, washouts, and chug-holes when it is dry. It is impassable to anything by 4x4 vehicles when wet, and sometimes even not then. Travel at your own risk. Passenger cars can and do make the drive regularly when the weather is good, but be prepared to turn around or get stuck if you attempt to drive to the park in wet weather. Once Route 57 reaches the park boundary, it becomes paved. Proceed to the visitor center and pay the fee, as well as get your free back country hiking permit for Penasco Blanco. Then drive along the Chaco Canyon loop road. Before the road crosses Chaco Wash, past Pueblo Bonito, there is a turn off for Pueblo del Arroyo. Turn and park your vehicle there.